Part of our mission statement is to be intolerant of waste, and to be involved as responsible citizens in our communities. To stay true to this mission, initiatives we’ve participated in have included the instruction of our front-service clerks on proper bagging techniques, bag reduction goals for every store and communication campaigns to encourage the use of reusable bags. Since 2007, we have distributed 54 million reusable bags. When you decide to purchase a bag, ten cents of the bag purchase go to support sustainability projects in local communities. One of the questions we get most at Publix is what happens to our plastic bags after they’re returned to the recycling bins in the front of our stores? We’ve partnered with our Sustainability team to provide more information to you. Plastic bags use 71% less energy to produce than paper bags and less than 6% of the water needed in the manufacturing process. These statistics are based on a bag capacity rating of one paper bag to 1.5 plastic bags. Plastic bags generate 39% less greenhouse gas emissions than non-composted paper bags, and 68% less greenhouse gas emissions than composted paper bags. Plastic bags generate 4,645 tons of CO2 equivalents per 150 million bags, while non-composted paper bags generate 7,621 tons, and composted paper bags generate 14,558 tons, per 100 million bags produced. After four or more uses, reusable plastic bags are superior to all types of disposable bags —paper, polyethylene and compostable plastic — across all significant environmental indicators. Bubble wrap and air pillows are acceptable to be recycled in our bins. Now that you’re familiar with the process of what happens to plastic bags after they’re returned to our recycling receptacles, our Sustainability teams provided us with more information about the difference between plastic and paper bags, and their impact on the environment. Paper does not degrade or break down at a substantially faster rate than plastic does. Due to the lack of water, light, oxygen and other important elements necessary for the degradation process to occur, nothing completely degrades in modern landfills. Even though traditional disposable plastic bags are produced from fossil fuels, the total non-renewable energy consumed during their lifecycle is up to 36% less than the non-renewable energy consumed during the lifecycle of paper bags and up to 64% less than that consumed by biodegradable plastic bags. Using paper bags generates almost five times more solid waste than using plastic bags. Did you know about all the efforts Publix takes to be sustainable? Learn more here. Hi, I’m really grateful that Publix offers this recycling option. It is super important to keep plastic bags out of the oceans and the waterways. This is why I prefer paper bags. Paper bags do get recycled. Whereas even though you offer the recycling of grocery store bags most people do not use it. 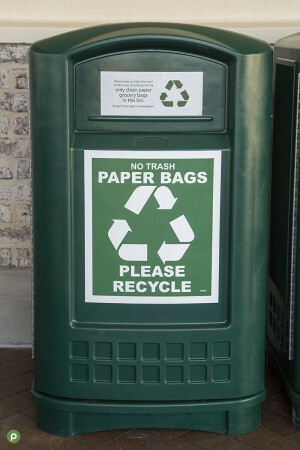 Is there another way you could encourage your customers to use the recycling bins at your stores? The bins are in an area where no one can see them unless they were looking for them in the Publix I use on Daniel Island. Also, it is so great that #4 plastic is accepted. This plastic is often used for gardening soil, potting soil, mulch, etc. I imagine it has to be thoroughly clean before we can put it into the bins, correct? We are having an Earth Day event in our community – the only grocery store we have is a Publix. Would it be possible to get a poster or a flier with the list of items that can be recycled at the Publix? Hi Jacqueline, I recommend speaking with the Store Manager at your local Publix or reaching out to our Customer Care team at https://www.publix.com/contact to be put in contact with our Sustainability team. Thanks for reaching out! I read on the website how2recycle.info, printed on several Amazon prime bubble wrap envelopes, that these envelopes can be placed in the plastic bag recycle stream of grocery stores, including Publix. I see the list here of accepted plastics in which these envelopes are not mentioned but air pillows are mentioned as not accepted. Please let me know if you accept these Amazon envelopes and if not perhaps how2recycle.info should be made aware. Hi Richard, historically we’ve been told that bubble wrap and air pillows are not acceptable in our bins, but we have since found that information is incorrect and that these items are allowed in our bins. Where does your stuff actually get processed/recycled? I read that China doesn’t accept plastics anymore. And why are popped air pillows a safety hazard to your employees? Hi Kerstin, historically we’ve been told that bubble wrap and air pillows are not acceptable in our bins, but we have since found that information is incorrect and that these items are allowed in our bins. hi Matthew, thank you for this post. It is my understanding that plastic in the ocean and waterways does not ever fully degrade nor breakdown and is now getting into the food chain in the form of micro plastics. I am thrilled that Publix is the only store in my county (Volusia, Florida) that offers a recycling program… but I have to say I’m depressed when I go to Publix multiple times weekly and look around, and find that I’m literally the only one using reusable bags rather than single use plastics at checkout. I don’t know how much the Publix reusable bags are selling for these days by the way because I rarely see them displayed anywhere in the store. Publix should lead the way across the country and start a major campaign against the waste of single use plastics at checkout time. There frankly is no information nor education to the public advertising the sale of your reusable bags at your store and what a huge impact it can make on the environment and the ocean, if your reusable bags were used. There could be a once a month campaign at each location for example, reusable bag giveaways/sales or any incentive to purchase your reusable bags along with information on the Publix recycling program. I own a small business in my hometown, I would donate tens of thousands of reusable bags at your Publix locations in Volusia Co if I had the opportunity to sponsor. Is this a possibility? I applaud the Publix efforts thus far but there’s so much more that can be done in the form of setting a new standard as the current state of daily distribution of single use plastics at checkout is not sustainable. Does your recycling program also include other polystyrene items? There is a container for egg cartons and foam trays, but are other #6 plastics like yogurt cups, food trays, coffee cup lids, etc. included? When the container is labeled “egg cartons” and “foam trays”, I assume only Styrofoam items are included. The more plastic-y polystyrene can’t be recycled in curbside, and I would like to avoid throwing them out. The Publix website only mentions plastic shopping bags, newspaper sleeves, and dry cleaning sleeves, but when asked in the comments here, you’ve provided additional items that are accepted. Other websites claim Publix will also accept the items in this list, which can you confirm? Below is a list of the recyclables accepted at Publix. We hope this is helpful. Unfortunately,bubble wrap and air pillows are acceptable in our bins. How can I get our local publix’s to stop putting a single item in a plastic bag. I go get my lunch sub and the cashier has it in a plastic bag before I can even tell them no plastic bag (this happens at the Pompano Beach store as well as Miami Beach stores). They are so over eager to give me a bag, and look at me funny when I say no plastic bag please – it almost feels like they are incentivized to give bags away. If you want to reduce the number of plastic bags given out (save money and reduce the amount of unwanted bags), I suggest every cashier ask “did you bring your own reusable bags , or would you like paper or plastic?” and even incentivize every cashier through some kind of game / prize. I really like the other stores that give a $.10 donation to a local non profit when you bring your own bag. We must encourage everyone to reduce waste, and recycling should only be encouraged after reduction. Hi David, can you please reach out to our Customer Care team about your concerns? They’d be happy to assist you further. They can be reached at https://www.publix.com/contact. I agree with David, Publix should seriously work harder at training associates not to instinctively put everything into a plastic bag. Give the the shoppers a choice and for the love, if someone walks up with all of their items in a reusable bag, then please put them all back in there. As for the life-cycle of a plastic bag and energy to produce these items, you also have to factor in the all the transportation costs and also the externalities of these items becoming pollution. Paper will at least breakdown outside of these archaic landfills, plastic bags can last up to 1,000 years in the marine environment and continue release chemicals like BPA as they breakdown. Requiring a reusable bag or at least shifting an emphasis from plastic bags (fee per bag) is nothing new and it is time for everyone to take some responsibility for our environment. The best option here is for reduction of single use plastics, Publix saves lots of money this way too. 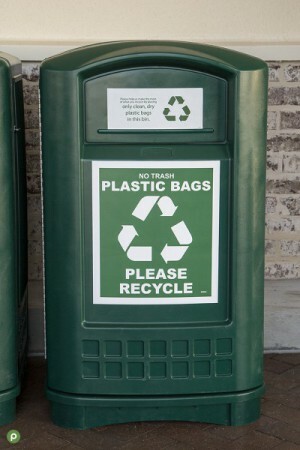 Does your recycling process accept #4 heavy white plastic bags? Hi Kathy! Our recycling program does accept #4 heavy white plastic bags. Thanks for the information, Matthew. I recall reading a while back that customers could also include things like the plastic film wrappings that toilet paper and paper towels come in. Has that changed? Hi Chris, that has not changed! You can recycle those as well. Thanks for shopping with us.